Regardless of children’s abilities, nature has a positive impact on well-being and helps children acquire harmonious, healthy lifestyles. Well-being is achieved through a delicate balance between healthy human processes (psychological, physical, spiritual) and healthy environments (landscapes, weather, built environments, and the social circumstances of daily life). Being outdoors in carefully designed green environments can help maintain the healthy growth of children. Rich, natural settings support children’s unfolding potential in a fluid way so they enjoy every stage of development, building knowledge and wisdom at each level. Like a dynamic mirror, the environment presents the child with all life’s facets: birth, death, and metamorphosis. Cycles of life offer clear messages of hope and recovery. The endless richness of nature wraps children in colors, textures, tastes, fragrances, and movement; it encourages curiosity and motivates a passion for learning. The drama of meteorological phenomena (thunder, wind, rain) obliges humans of all ages to re-dimension their finite strength in relation to the power of nature (Cosco & Moore, 1999). Think back to your childhood. It is likely some of your fondest memories are of being outdoors. Do you remember exploring, picking berries, playing with mud, building forts, climbing trees, fishing, and playing with water? Although research and personal experience tells us that being outdoors has a strong impact on healthy development, today’s children lack such opportunities. Progressive educators embraced this critical healthy development path long ago. This Symposium featured presentations, discussions, and an interactive design workshop. Participants visited model outdoor environments for play, learning, and healthy living at a Montessori School, a Waldorf School, a childcare center working with Reggio Emilia principles, and a universally-designed community park. We built on the well-documented positive effect of nature on children’s behavior, to demonstrate how environments designed for daily contact with nature support early and middle childhood learning and active lifestyles. We explored the design of environments for children and their families from the first year of life (welcome to planet Earth!) to pre-adolescence in formal settings such as schools and childcare centers, non-formal settings such as children’s museums, botanical gardens, and zoos, and informal settings such as residential areas, neighborhood parks, playgrounds, and vacant lots. Our goal is to raise awareness about the role of designed natural environments for healthy child development and providing information and tools for creating them. Participants will include architects, landscape architects, designers, public health professionals, childcare providers, educators, extension agents, master gardeners, parks and recreation professionals, horticultural therapists, and other individuals interested in creating natural environments for children to improve their quality of life. David Kahn, Executive Director NAMTA. The child in nature: A developmental perspective from early childhood through adolescence. Jim Greenman, Senior Vice President for Education, Bright Horizons Family Solutions. The role of childcare design to ensure daily outdoor play. Child Environment & Behavior Researcher and Co-Director of the Landscape and Human Health Laboratory, University of Illinois at Urbana-Champaign. Healthy development by design: Evidence of the benefits of nearby nature. Lori Little, Bright Horizons Family Solutions (BHFS). 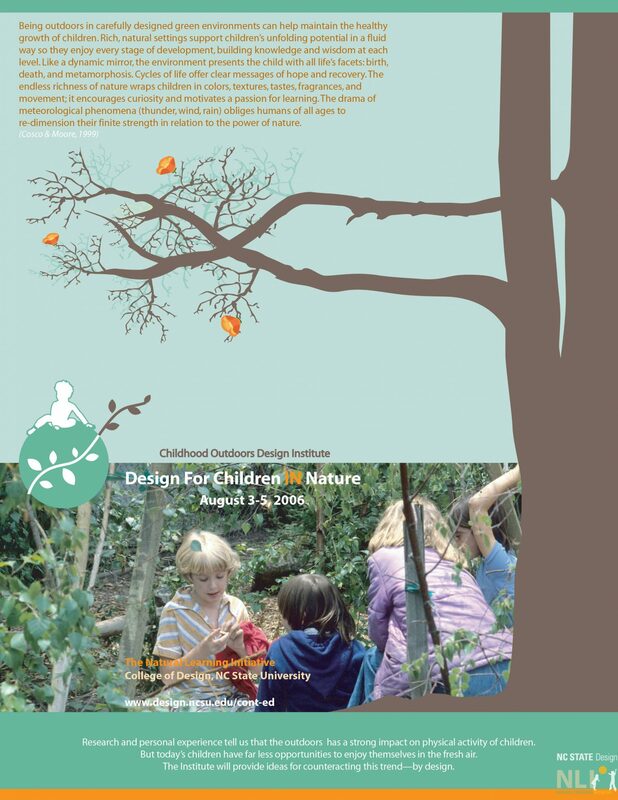 Close with nature: The impact of design for integrating Reggio Emilia perspectives in a natural outdoor environment. Betsy Thigpen, Training and Technical Assistance Services, Western Kentucky University. Why we are here. Dr. Karen DeBord, Dr. Linda Hestenes, Dr. Nilda Cosco, Robin Moore, and Janet McGinnis. Measuring outdoor quality with POEMS—The Preschool Outdoor Environment Measurement Scale. Nilda Cosco, the Natural Learning Initiative, College of Design, NC State University. Evidence to support the design of rich environments for children. Robin Moore, the Natural Learning Initiative, College of Design, NC State University. Designing-IN nature in middle-childhood settings.